Won for Best Picture; Best Director; Best Actress-Diane Keaton; Best Screenplay. Nominated for Best Actor-Woody Allen. When I was 10, my parents took me along to see 1977’s Annie Hall. Note that I didn't say "dragged me along," which is the attitude one might expect from a youngster. No, back then I was into media that seemed a bit beyond my age, and while I'd change my mind somewhat about him later, I really liked Woody Allen at that time. More than 30 years later, I've watched Annie Hall again, and while I liked it, I have no idea what my 10-year-old self saw in the film. Did I get any of the jokes? I'm not sure how I could have. I mean, I knew a fair amount at that age, but I know that I lacked the sophistication to understand much of what was happening in this story. Not to mention that I also did not yet have the "life experience" to take to heart the romantic aspect of the flick. Hey, I didn't even like girls yet at that age, though I was getting there. Annie is definitely a relationship film, so it works much better for one who has loved, especially if one has also lost. That would be me, so I connected surprisingly well to Annie. As I alluded, I've soured some on Woody Allen over the last few decades and generally just find his persona to be irritating and largely unfunny. Actually, it's not so much that he doesn't produce good humor; it's just that something about Allen himself seems to rub me the wrong way. Tellingly, the two Allen films I've most enjoyed are Radio Days and Purple Rose of Cairo, both of which do not present Woody in a performing capacity. In Annie Hall, we follow the life and loves of comedian Alvy Singer (Allen). 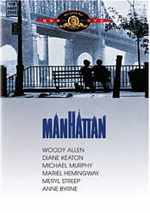 Most of the flick concentrates on his relationships, with an emphasis on the ups and downs he experiences with Midwestern girl Annie Hall (Diane Keaton). We watch the pair as they go through their lives together. That’s not what you’d call a plot-driven film, so I struggled to compose a more detailed synopsis. I could’ve added other specifics, but they seemed irrelevant. The movie’s about Annie and Alvy – that’s it, and anything else seems semi-irrelevant. Even without much story, I like Annie Hall, as I find it to be surprisingly effective and well done. It's a very touching, sweet and funny exploration of male/female relationships, and also one that rings true. I was also surprised at the quality of the acting. Allen essentially plays himself - as usual - so there's only so much he could do to muck it up; he doesn't and is perfectly acceptable - and maybe a little less annoying than usual. The big surprise comes from Diane Keaton. I usually can't stand her; from other appearances, I've seen her to be one of the stiffest and least convincing successful actresses in the business. That isn't the case with her work in Annie. Keaton manages to portray Annie as a real person, no mean feat in what was a demanding role; she had to show her character in a wide variety of time periods and situations and she pulled it off admirably and convincingly. She won an Oscar for her work here, and she deserved it. Annie Hall includes an amazingly strong supporting cast. None of them are terribly remarkable here - though they're all good - but it's an impressive roster. Annie features Carole Kane, Shelley Duvall, Christopher Walken, Jeff Goldblum, John Glover, Shelley Hack, Beverly D'Angelo, and - in a shot from so far away that the only way you'll know it's her is from the credits - Sigourney Weaver. Wow! Considering all of these folks were at best semi-unknowns at the time, that's pretty amazing. But perhaps not as amazing as the fact that I really like this film. I don't expect I'll change my opinion of Woody Allen anytime soon - and I'll never forgive this movie for stealing the Best Picture Oscar Star Wars deserved - but I certainly have more respect for the man. 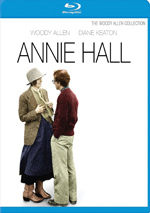 Annie Hall appears in its original theatrical aspect ratio of 1.85:1 on this Blu-ray Disc. This wasn’t a sparkling presentation but it offered a good representation of the original film. Sharpness was acceptable but not often much better. Close-ups tended to be strong but wider shots often appeared somewhat soft and bland. Though this meant the image lacked great precision, it seemed representative of the source photography, as it looked “right”. No issues with jaggies or shimmering occurred, and I also noticed no edge haloes. The film came with a nice, natural layer of grain, so I didn’t sense any overuse of noise reduction, but I saw occasional print flaws; the movie showed a few small specks. Like the sharpness, colors showed their age. The movie went with a natural palette and the tones looked fine, though they tended toward the oversaturation of the era. Skin tones could be a bit pink, and the movie took on a reddish tint in general. Again, this reflected the source photography, so I didn’t expect the hues to be peppier. Blacks were fairly dark and tight, while shadows showed good clarity. Again, nothing here came across as objectively impressive, but the image offered a nice representation of the way the flick should look. As for the film’s monaural, it seemed perfectly sufficient for this film. This was a tremendously dialogue-heavy movie; effects and music appeared, but I'd guess that speech constituted 90 percent of the audio. Dialogue consistently seemed clear and intelligible, with nice warmth and no edginess. Music and effects both appeared fairly ordinary, but that was fine. Again, they had little to do here, and they appeared more than adequate given the flick’s constraints. This became an acceptable mix. How did the Blu-ray compare to the original 1998 DVD? It offered a big step up, especially in terms of visuals. The audio was pretty similar; the Blu-ray seemed a bit warmer, but there’s not a ton that could be done with the film’s 35-year-old mono stems. On the other hand, the picture quality demonstrated substantial improvements. 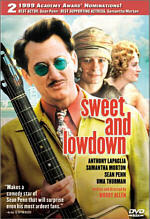 The DVD was acceptable for what it was: an early transfer that lacked anamorphic enhancement. It looked good on smallish 4X3 TVs, but it wouldn’t hold up nowadays. The Blu-ray showed substantially stronger clarity and seemed like a more accurate representation of the source. After 35 years, Annie Hall remains arguably Woody Allen’s finest achievement. I might prefer a couple of other films, but it’s still a strong enterprise with few flaws. The Blu-ray provides good picture and acceptable audio but skimps of supplements. I wish Allen would open up to bonus materials, but I don’t blame the Blu-ray’s producers for this issue. This becomes a nice representation of an effective film.